With today’s hectic lifestyle, we feel it is essential to take some time out for reflection and relaxation. By indulging yourself with one of our relaxation massage therapies you will feel the benefit of the whole experience on your general health and wellbeing for much longer than the therapy itself. We provide a friendly, personal and professional service, whether you are visiting for a quick eyebrow wax or a full pamper package. With over 13 years industry experience and qualifications from the International Therapy Examination Council (ITEC) and the Confederation of International Beauty Therapy and Cosmetology (CIBTAC) you couldn’t be in safer hands. 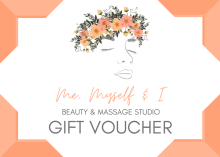 Come to our little oasis of peace and tranquillity in the heart of Oban to leave Me, Myself & I Beauty feeling relaxed, refreshed and revitalised and definitely more beautiful inside and out! Enjoy browsing our website and we hope to see you soon.